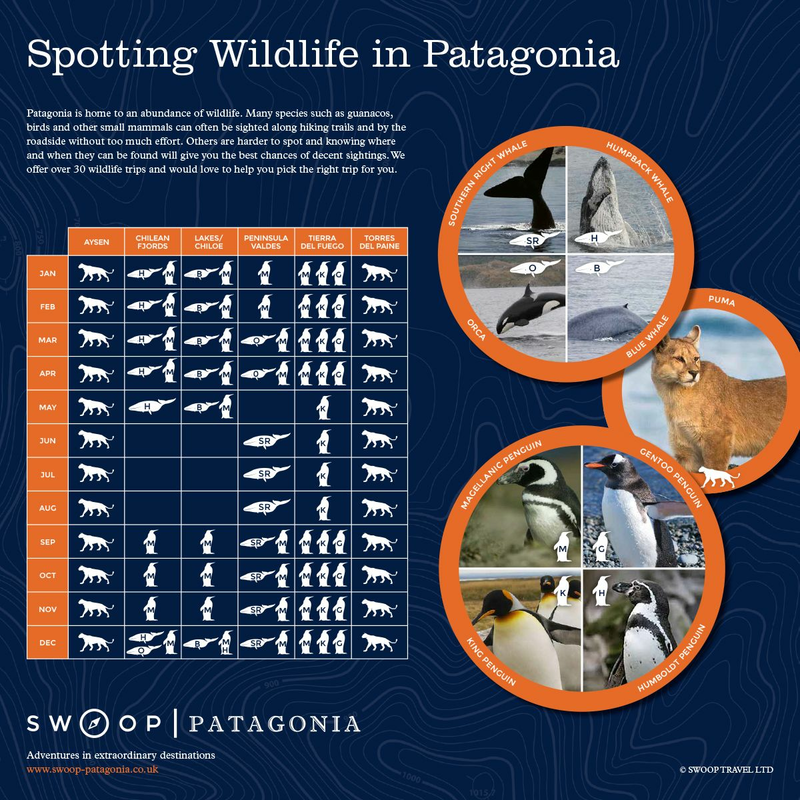 Patagonia is home to four penguin species - Magellanic, Humboldt, Gentoo and King. Depending on the species and the season, the inquisitive creatures can be seen anywhere from Punta Arenas to Tierra del Fuego on day trips to rocky hillside nests or boat landings at giant colonies. Closely related to the African Penguin, Magellanic Penguins are the only migratory, offshore foraging species. They are migratory birds, moving north in the winter months, often as far as Peru or Brazil. Magellanic penguins generally breed in burrows or under bushes, in a variety of habitats from low forests to grassland to bare rocks, often on islands or headlands. Some colonies on the Argentinean side number several hundreds of thousands of pairs. Their diet is fish based: mainly anchovies and sardines, supplemented by cephalopods. Second largest and similar in appearance to the Emperor penguin, King penguins have dark orange cheeks, white bellies, and light grey backs. They live in dense colonies, maintaining territories within pecking distance of each other amongst tussocks & sloping beaches. Adults rear up to two chicks every three years, and no other bird has a longer breeding cycle! They take 14-16 months to fledge a single chick, which may be left to fast for up to 5 months during winter (May- September). Their diet is more specialised than other penguins - they prefer pelagic fish such as lanternfish which make up over 995 of their diet. Gentoo penguins can be identified by their orange/red lower mandible, and the white patch above each of their eyes (after 14 months of age). They are closely related to Chinstrap and Adelie penguins but usually live in smaller colonies that are less densely packed. They tend to stay close to their colonies all year round, but vagrants have been found in various locations. Their diet varies depending on where they are living, but generally consists mainly of crustaceans (particularly Krill), as well as benthic fish and occasionally squid! Humboldt Penguins overlap breeding grounds with Magellanic Penguins around Puerto Montt and the island of Chiloe. They look very similar to Magellanic penguins, but without the secondary black breast band and wider white band around the head. Humboldts also have more extensive areas of bare facial skin, including a pink fleshy patch at the base of the lower mandible. They nest in burrows, often dug into thick guano deposits, among boulders, in sea caves and occasionally in the open, and tend to forage on shore, close by to the colony after sunrise. Their diet is based on small schooling fish such as anchovies and sardines, supplemented with the occasional squid! The rockhoppers name refers to the two-footed hops they make as they move up and down the paths of the nesting colony. Rockhoppers are confident little penguins and show little fear of people or larger animals. They feed on krill, squid and fish which they swim to depths of 100m to catch. They nest in colonies on top of sea cliffs. Pairs will return to the same spot each year in October and lay two unequal sized eggs in November, they will usually only raise one chick, the one that hatches from the bigger egg. The male will provide most of the incubation and brooding duties, staying at the nest, fasting, whilst the female finds food for the chick. Once the chick joins the creche with the other young, the male will forge for food too. After ten weeks the chicks will fend for themselves, at this point the adults undergo a 25 day moult before leaving the colony. Where can I see penguins in Patagonia? If you have only one day and want to see as many penguin species as possible, Martillo Island in Ushuaia is your best bet - it has resident magellanic and gentoo penguin colonies, as well as the occasional rogue King penguin. A new colony of King penguins has been establishing in Tierra del Fuego. It is the only King Penguin colony outside of the Sub-Antarctic islands and is therefore very unique and special. You can visit this colony on a one day trip by plane or two day trip by ferry from Punta Arenas. You can observe and photograph these colourful metre tall penguins going about their business from a purpose built hide that keeps the penguins from getting disturbed or distressed. A small group of Southern Rockhopper penguins have also started to join the King Penguins at Useless Bay. Like the Kings, the Rockhoppers are in abundance in the Sub-Antarctic islands but rarely seen in South America, however, it appears they have started using Bahia Inutil as a place for their post-breeding moult. Isla Magdalena is home to a colony of around 120,000 Magellanic penguins. You can walk amongst them (within roped off areas to preserve their habitat) for around an hour. Isla Marta is home to over 1000 sea lions, a variety of bird species, a group of elephant seals, and a colony of Magellanic penguins. You can circle the island by boat but are not allowed to disembark. You can access these islands on a day trip by ferry or zodiac boat from Punta Arenas, or on a three or four night adventure cruise between Punta Arenas and Ushuaia. The only way to visit this Magellanic penguin colony is by joining one of the weekly expedition cruises between Punta Arenas and Ushuaia. These cruises take you on a zodiac boat trip among the network of islands that house this colony, and although you cannot get off and walk among them, your zodiac boat will beach on the shores of several of the islands so that you can get within a metre or two of the curious little birds! Martillo Island is accessed from Ushuaia, Tierra del Fuego. It is a very special place because it is home to two (sometimes three!) different penguin species: Magellanic, Gentoo and the odd King penguin! A 6 hour boat trip from Ushuaia takes you up the Beagle Channel to Martillo Island and back. You visit a sea lion colony, a nesting island for Cormorants, the famous lighthouse called Les Eclaireurs, and of course Martillo Island itself. The boat beaches at the island, where you can view the penguins from on board. A great trip for bird watchers and nature lovers in general. You can also reach Martillo Island by road, also visiting to Estancia Harbertonen route. This is a 6 hour excursion, where you have the opportunity to walk with the penguins for an hour on the Island. A great option for getting you up close to the penguins in their natural habitat. Take a canoe trip which visits various locations including Gable Island and Martillo Island. You get on a small boat to Martillo Island, where you'll beach (but not disembark) to view the penguins. A great trip for more active people who are looking for a mixture of hiking, canoeing and penguin spotting! The Valdes region is home to an abundance of wildlife, and several penguin colonies. The most well known and popular colony is at Punta Tombo, which is home to the the largest Magellanic penguin colony in the Americas. Approximately one million penguins come here each year to roost between September & April. Penguin watching tours head here from both Puerto Madryn and Trelew, or you can drive there independently with a hire car. The best time to visit is between October and March, but it can be quite busy and touristy. The beautiful island of Chiloe is host to two different breeds of Penguins, who nest on three rocky islands accessible from the lovely beach of Punihuil. It is in fact, the only place where both Magellanic and Humboldt penguins nest together! You could choose to take a day trip to the island from Puerto Varas, or to spend a night or two on the island itself. Tucker Islets are a collection of tiny islands absolutely teeming with Magellanic penguins. We landed by zodiac boat about a metre from a the colony, giggling as we watched them hop clumsily over streams and rocks. What are baby penguins called? Baby penguins are called chicks. When they are born they have a coat of light feathers, which later moults into their waterproof plumage. They grow on a diet of food regurgitated by their parents, and when they begin to walk around, they gather in groups known as crèches, waiting for the adults to return from sea to feed them. Once they are strong enough to venture out on their own, to feed, swim and socialise, they set off from the colony until they are ready to breed. This can be 2-5 years, depending on the species. What’s the smallest penguin species? The smallest known penguin species is the Little Blue or Fairy Penguin, standing at an average of 16 inches. There is a huge variation between species - the largest living species of penguin is the Emperor, which reaches 47 inches in height. What do you call a group of penguins? In water, a group of penguins is known as a 'raft', and on land, a 'waddle'. There are also other collective nouns for penguins on land, including a 'rookery', 'colony' and 'huddle'. Penguins are colonial birds as they nest and breed in close proximity as a group - even at sea, they tend to swim and feed in groups. Penguin colonies are very large; in South America colonies consists of thousands of individuals, in Antarctica they can reach the millions in number. Where can I see penguins in South America? Across Peru, Ecuador, the Falkland Islands, Argentina and Chile, seven species of penguin can be seen. Within Patagonia, the South American Magellanic penguin spends the summer months in both Argentina and Chile, migrating north in winter. The fastest growing colony in South America is at Punta Norte, and the biggest at Punta Tombo - you'll be able to walk alongside thousands of penguins as you explore the reserve. In the Valdes Peninsula, the Magellanic shares it's home with countless other animals of the land and sea. The area around Puerto Montt and Chiloé island holds a unique claim as the only place in the world where Magellanic and Humboldt penguins nest together. If you want to see Rockhopper penguins, Puerto Deseado is your place, whereas Martillo Island is the favoured residence for the Gentoo penguin. The majority of penguin species, and the largest colonies, inhabit Antarctica or the surrounding sub-antarctic islands. Most trips to Antarctica depart from Ushuaia, the southernmost point of Argentina, so you could easily coordinate some time in Patagonia with a cruise to Antarctica. How fast can penguins swim? Penguins are known as the fastest-swimming (as well as deepest-diving) species of bird. Most make their way through the water at speeds of 4-7mph, although Gentoo penguins can top 20mph! See these rapid swimmers on a boat trip to Martillo Island, a 15 minute journey from Ushuaia. The penguin encounter was amazing!! Penguins have always been my favorite animal so seeing them in their natural environment in a place that doesn't sensationalize it but respects the colony was really a dream come true. Landing on Isla Magdalena to see the penguins and sea lions was great fun. The King Penguin tour (many king penguins and their babies - just adorable) and the Birding tour (birds, geese, sea lions, wild horses and dolphins galore) were outstanding. Our guide was outstanding and personable and we saw wildlife beyond what we could have imagined. The Chilean fjords had just about everything: humpbacks, penguins, sealions; remote location; great scenery; glaciers; boat trip; small group, no crowds. Patagonia is an area of fabulous biodiversity, home to many species classified as endangered or vulnerable. We work with carefully selected local partners to get you close to the animals in the wild without risk to their environment. The season and the region will determine what Patagonian wildlife you'll encounter.